Surf the web inside your favorite software help without opening an instance of Internet Explorer or Firefox. 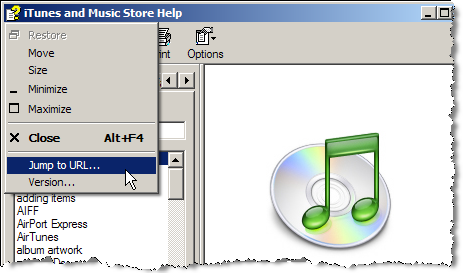 The following technique can be applied to any Windows XP software (like Notepad, Calculator, Apple iTunes, WordPad, MS Paint or Windows Media Player,) that bundles the help files in Microsoft HTML Help format (CHM). Step 2: Either press F1 or click the help file to open the Help file. Step 4: Type the full URL in the dialog and press Enter. The website opens in the main panel of the help window. You can browse the web just like IE, access the contextual IE menue or use the Back/Forward buttons. To open another website, repeat Step 3.